The Inner Forth is an incredible place that has been formed by nature and shaped by people. A place steeped in history that holds so much importance to the wildlife and the people that have lived here, both past and present. A place that deserves to be recognised and celebrated for its cultural, natural and historic heritage. 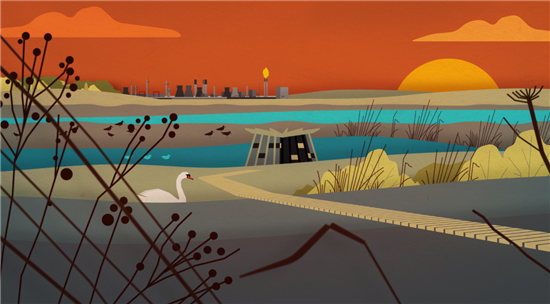 ‘The Inner Forth: formed by nature, shaped by people’ animation has been created as a learning resource for local schools and students to learn about the Inner Forth – its incredible history, how it was formed and what has influenced its changes. It was both easy and extremely hard to research and create this animation. Easy because there is so much to tell people about, but hard because how do we fit it all in to 6 minutes! Working with Interference Pattern has been a delight – they have truly captured the vibrancy and diversity of the area in a dynamic and captivating way, with the wonderful colours and animation style. I thought I’d provide a very quick run through of some of the topics we covered though out the animation, and hopefully you will enjoy the real thing by following the link below. Signs of the past can be found all over the Forth. 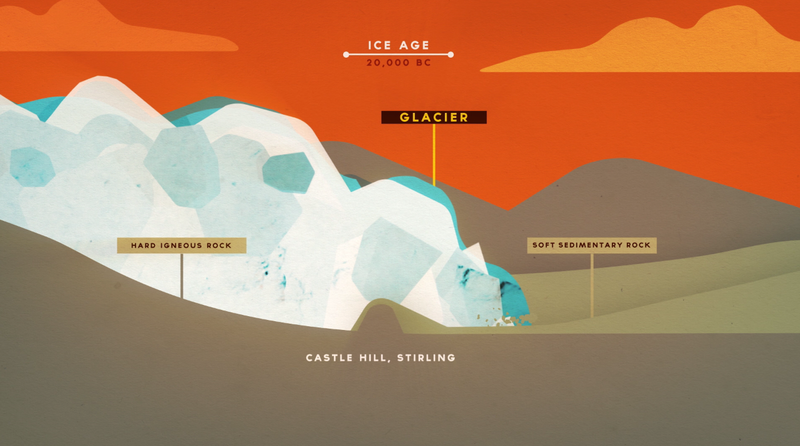 The flat bottomed valley pinched between the Touch and Ochil Hills was scoured out by ice thousands of years ago, carving through the landscape leaving behind geological features such as the small hill on which Stirling Castle was built. 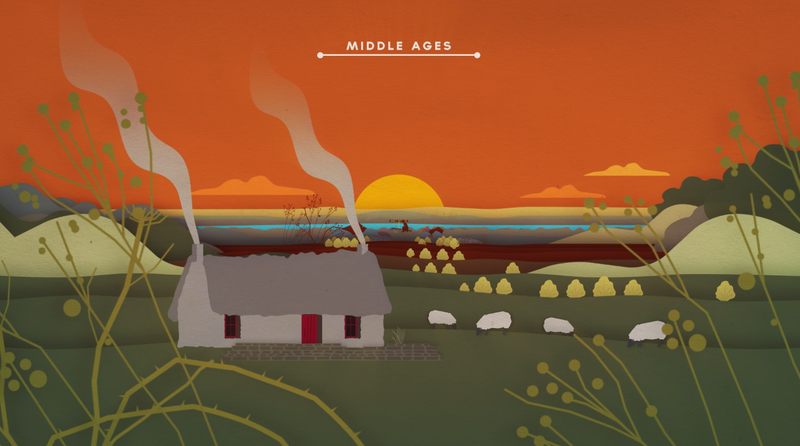 Once the ice had melted and waters receded, the Forth became more hospitable for people. Shell middens have been found around the Forth, which are evidence of early settlers using the surrounding resources. We now start to see humans shape the landscape with changes to agricultural practices and settlements. Agriculture has changed dramatically from small scale crofts to large industrial-sized operations in a very short amount of time. Building sea walls allowed land owners to reclaim land from the river and increased areas for growing crops and grazing animals. Agriculture wasn’t the only big business around the Forth. The geological make-up of the area resulted in huge coal deposits. This fuelled much of the industry throughout the area and further afield, and was at the heart of the industrial revolution in Scotland. Together with the fertile soils, this led to distilleries such as the one at Kennetpans, which exported whisky nationwide and across to Europe. As industry and the population grew, we start to see power plants, the oil refinery and more land reclaimed from the river for development. However, throughout all this change there has been one thing that has remained almost constant, the incredible wildlife. The creation of huge areas of wetlands after the ice melted meant the Forth catchment was a magnet for all kinds of species. Today, despite the huge changes to the landscape, much of the Forth estuary is nationally, internationally and globally designated for its important conservation value being a fantastic place to see wintering wildfowl and waders. This is why we wanted to highlight the Inner Forth’s incredible story and importance. To show school students that they live in this fantastically diverse place full of history and amazing wildlife. We want to show them how the landscape has changed dramatically over time to become what we see today. If you look you can see evidence of this all around. We want to inspire people to venture out and see for themselves the incredible landscape right on their doorstep: visit RSPB Black Devon Wetlands and enjoy the wildlife and countryside; climb one of the Ochil hills and look down to the flat valley that was once full of ice; visit Kinneil Museum or Bo’ness and Kinneil Railway to learn about the local history of the area. So much to do and see, the only problem is where to start! Please visit the Inner Forth Landscape Initiative You Tube channel to see ‘The Inner Forth: formed by nature, shaped by people’ animation by clicking here. Enjoy!